Slip gauges were first developed by Johnson, and sometimes also called as ‘Johnson Gauge Blocks’. These are rectangular blocks of steel having a cross-section of about 32 mm x 9 mm. Slip gauges are the universally accepted ‘standard of length’ in industries. These are the simplest possible means of measuring linear dimensions very accurately. For tool-room and other precision work, the ordinary methods of measurement are not always accurate. Micrometer and verniers calliper can be used to check tolerance fine within 0.002 to 0.02 mm, but for fine tolerance they are not effective. Thus there is a need of instrument which can measure fine tolerance limit. The means to do so are ‘slip gauges’. They can be used to measure tolerances in the range of 0.001 to 0.0005 mm very accurately. Gauge blocks are available in sets with steps with steps of 10, 1, 0.1, 0.01 and 0.001 mm. on small size blocks, the size is marked on the measuring face, and large blocks are marked on a side surface. Letter “M’ is used for mm units (Metric units). The number of pieces in a set is given by the number followed by letter E or M.
For Example, E 81 refers to a set whose blocks are in inch unit and 81 in number. Similarly M 45 refers to a set whose blocks are in mm units and are 45 in number. Apart from these above, two extra gauges of 2.5 mm each are also supplied as protective slips. The purposes of protective slips are to prolong the life of slip gauges. These are often made of the same material as the rest of the sets or sometimes they may be made from tungsten carbide, which is a wear resistant material. Protective slips identified by letter ‘P’ marked on one face. These are placed at each end of the assembled blocks, to ensure that any wear or damage is confined to these two blocks. Building a size of 43.716 using a pair of 2.5 mm protector blocks and M45 set. If two blocks are twisted together under certain pressure, it will be found that due to molecular attraction and atmospheric pressure they will adhere to each other quite firmly. This process is known as wringing. 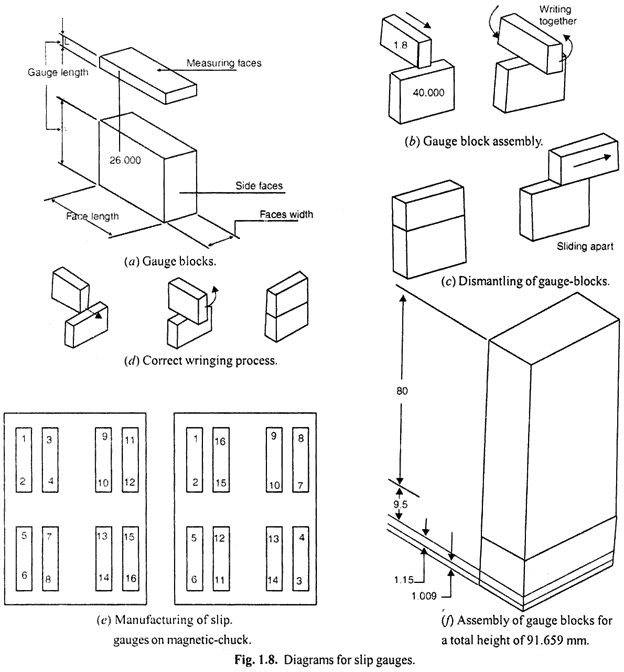 This Process is very useful to produce a required size by assemble several gauge blocks. Before wringing of blocks; wipe them clean using a cloth, chamois leather, or a cleansing tissue. Vaseline, grease or dust should be removed by petroleum. Start wringing with the largest sizes first. Place two faces together at right angles as shown in figure (b) and (c), and, with pressure, twist through 90°. This action should be smooth and with constant pressure. When the largest gauges have been assembled, follow same process with the others in order of decreasing size of blocks. The accuracy of gauge blokes is affected by temperature changes. They are accurate within a temperature of 20°C and humidity controlled atmosphere. Their accuracy should be checked time-to-time against any warn out or deformation in the blocks. To do so, in industries, a set of gauge blocks are available as a reference set, to check the other working sets. (Material) Most of the slip gauges are produced from high grade steel, hardened and stabilized by heat treatment process to give a high degree of dimensional stability. Slip gauges can be made from tool steel, chrome plate steel. Stainless steel, chrome carbide, tungsten carbide etc. Tungsten carbide is an extremely hard, wear resistant, and most expensive material than steel. Sometimes chrome plating is also used to improves the corrosion resistance. Addition of chrome plates leads to the tendency of Flake-off, especially at the edges. Hence they are disliked by experienced workers. 1. The high grade steel gauge blanks are taken with appropriate size. 2. They are subjected to hardened and rough grinding process. 3. Then they are subjected to a cyclic low temperature heat treatment, to provide stability of dimensions and to relieve the internal stress. 4. A batch of 8 blanks of similar nominal size is mounted on eight Co-planner Faces of a magnetic chuck. 5. Their one set of Faces is lapped truly flat by lapping process. 6. By changing the lapped faces on magnetic chuck, opposite Faces also lapped truly flat. 7. Now, the required Parallelism and equality of size is achieved by interchanging four of the eight gauges as shown in figure 1.8 (e). They are interchanged diagonally and turned end for end. Thus any errors in Parallelism are equalized. 8. Now, to determine whether the gauges are the required size they are removed from the chuck, wrong together in combination, and their aggregate size compared with an appropriate size master in a suitable comparator. A magnification of 8 is obtained in this calibration since, as each of the 8 gauges must be identical in size, the difference between combination and master may be divided by eight and this difference is distributed to each gauge. 9. If necessary, individual block can be mounted on chuck to bring their individual lengths within required accuracy. Slip gauges are important means of measurement in industries and laboratories. 1. They universally accepted as a “Standard of length”. 2. They used for direct precise measurement where accuracy of work piece being measure is high. 3. They used with high-magnification comparators, to establish the size of the gauge blocks. 4. They are used for checking the accuracy of measuring instruments. 5. They are used to setting up a comparator to specific dimension. 6. They are used to check a batch of components quickly and accurately.